I have had incredible mentors and teachers throughout my life. The above quote continues to resonate with me and influences my daily decisions. It sounds simple – however sometimes it is not easy. The right thing could cost more money than budgeted. The right thing could upset someone. The right thing could take longer. The right thing is not what you want to do. The right thing takes you out of your comfort zone. The right thing could mean walking away, leaving behind all you know and all you have. However, the right thing is Always the Right Thing to Do!!!! Face your fear head on. Do what you know, what you feel, and what your gut is telling you. You are coming from your true and authentic self. Listen to the little voice within you, guiding you in the right direction. Take a few minutes to go within. 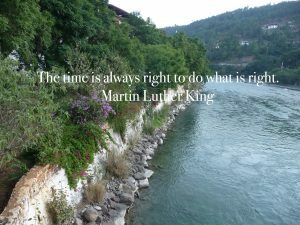 Then Ask yourself – What is the right thing to do? You cannot control how others will react. However, know that when you stand for what you truly believe in, and for what is right, it will all be okay. Be proud of your conviction to move forward.